There are four levels of structure found in polypeptides and proteins. The primary structure of a polypeptide protein determines its secondary, tertiary, and quaternary structures. The primary structure of polypeptides and proteins is the sequence of amino acids in the polypeptide chain with reference to the locations of any disulfide bonds. The primary structure may be thought of as a complete description of all of the covalent bonding in a polypeptide chain or protein. The most common way to denote a primary structure is to write the amino acid sequence using the standard three-letter abbreviations for the amino acids. For example gly-gly-ser-ala is the primary structure for a polypeptide composed of glycine, glycine, serine, and alanine, in that order, from the N-terminal amino acid (glycine) to the C-terminal amino acid (alanine). Secondary structure is the ordered arrangement or conformation of amino acids in localized regions of a polypeptide or protein molecule. Hydrogen bonding plays an important role in stabilizing these folding patterns. The two main secondary structures are the alpha helix and the anti-parallel beta-pleated sheet. There are other periodic conformations but the α-helix and β-pleated sheet are the most stable. A single polypeptide or protein may contain multiple secondary structures. An α-helix is a right-handed or clockwise spiral in which each peptide bond is in the trans conformation and is planar. The amine group of each peptide bond runs generally upward and parallel to the axis of the helix; the carbonyl group points generally downward. The β-pleated sheet consists of extended polypeptide chains with neighboring chains extending anti-parallel to each other. As with the α-helix, each peptide bond is trans and planar. The amine and carbonyl groups of peptide bonds point toward each other and in the same plane, so hydrogen bonding can occur between adjacent polypeptide chains. The helix is stabilized by hydrogen bonding between amine and carbonyl groups of the same polypeptide chain. The pleated sheet is stabilized by hydrogen bonds between the amine groups of one chain and the carbonyl groups of an adjacent chain. The tertiary structure of a polypeptide or protein is the three-dimensional arrangement of the atoms within a single polypeptide chain. For a polypeptide consisting of a single conformational folding pattern (e.g., an alpha helix only), the secondary and tertiary structure may be one and the same. Also, for a protein composed of a single polypeptide molecule, tertiary structure is the highest level of structure that is attained. Tertiary structure is largely maintained by disulfide bonds. Disulfide bonds are formed between the side chains of cysteine by oxidation of two thiol groups (SH) to form a disulfide bond (S-S), also sometimes called a disulfide bridge. Quaternary structure is used to describe proteins composed of multiple subunits (multiple polypeptide molecules, each called a 'monomer'). Most proteins with a molecular weight greater than 50,000 consists of two or more noncovalently-linked monomers. The arrangement of the monomers in the three-dimensional protein is the quaternary structure. The most common example used to illustrate quaternary structure is the hemoglobin protein. Hemoglobin's quaternary structure is the package of its monomeric subunits. Hemoglobin is composed of four monomers. There are two α-chains, each with 141 amino acids, and two β-chains, each with 146 amino acids. Because there are two different subunits, hemoglobin exhibits heteroquaternary structure. If all of the monomers in a protein are identical, there is homoquaternary structure. Hydrophobic interaction is the main stabilizing force for subunits in quaternary structure. When a single monomer folds into a three-dimensional shape to expose its polar side chains to an aqueous environment and to shield its nonpolar side chains, there are still some hydrophobic sections on the exposed surface. Two or more monomers will assemble so that their exposed hydrophobic sections are in contact. Do you want more information on amino acids and proteins? Here are some additional online resources on amino acids and chirality of amino acids. 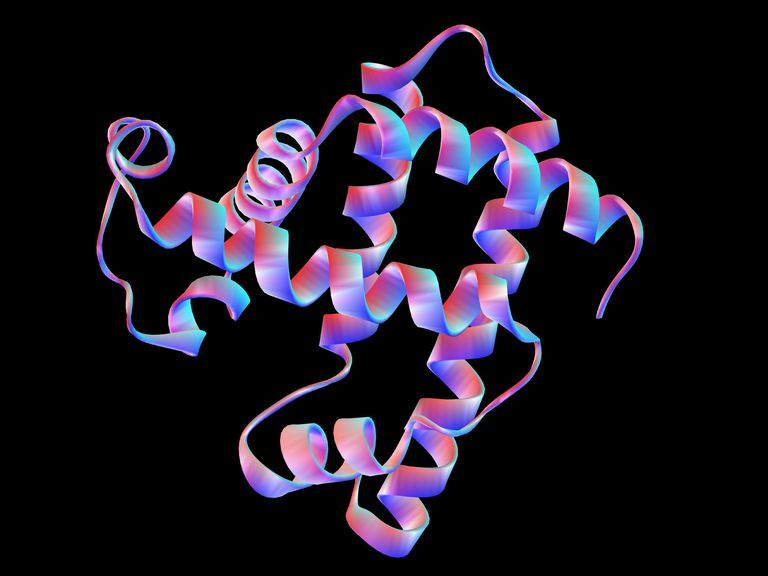 In addition to general chemistry texts, information about protein structure can be found in texts for biochemistry, organic chemistry, general biology, genetics, and molecular biology. The biology texts usually include information about the processes of transcription and translation, through which the genetic code of an organism is used to produce proteins. What are Monomers and Polymers?